Did you know that German immigrants started towns in Pennsylvania as early as 1683? 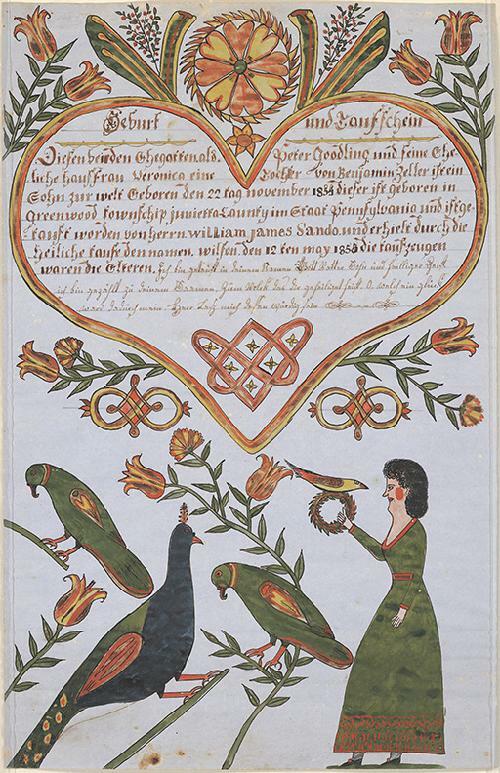 If you have German ancestry, you might be able to connect with your Pennsylvania German heritage using the Free Library’s Fraktur Digital Collection! 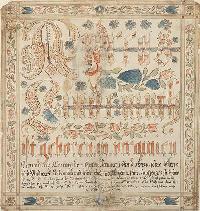 Pennsylvania Germans made personal documents – called fraktur – to record important life events such as births and baptisms. 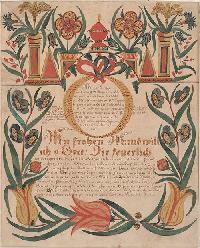 Our digital collection contains more than 1200 fraktur made in Pennsylvania, Ohio, Virginia, and surrounding states between 1750 and 1845. You can search our collection by entering the last name of your Pennsylvania German relative or by browsing by the first letter of the last name. Don’t worry if you don’t know exactly how to spell the name – the search engine is indexed phonetically (by sound) rather than alphabetically. Standardized spelling of proper names is a relatively recent trend, even in the United States. Through the 1800s, people often wrote their names according to how they sounded, so it’s not uncommon to find a person’s name spelled in different ways – even on the same document! Recent immigrants sometimes changed the spelling of their last names to better fit in with their neighbors. Other families modified the pronunciation of their last name but kept the original spelling. All of these factors created wide variations in the spellings of last names, which can make it difficult to find records of your relatives. In the 1930s, the United States Census Bureau recognized this problem and developed a coding system called Soundex to help people track down their ancestors. Using the US Census Bureau’s program as a model, we have indexed all of our fraktur in Soundex, so that you can find a name, no matter how many alternate spellings or variations it might have. 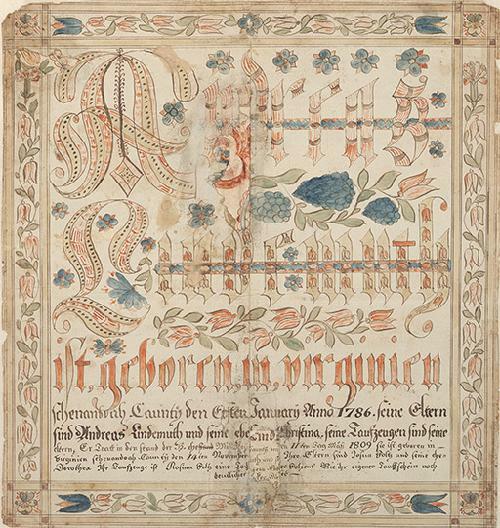 All you have to do is type in a last name to find the names from all of our fraktur records that sound similar to the one you entered. Say, for example, that your last name is “Bair.” When you type “Bair” into the search box, you will find fraktur that include every name that sounds like “Bair” including Baehr, Baer, Bähr, Bär, Bauer, Beier, Beyer, Biewer and Boyer. To learn more about Soundex, visit the United States National Archives website. For more Free Library resources to help you search for your family tree, check out our Genealogy Explore Topic. 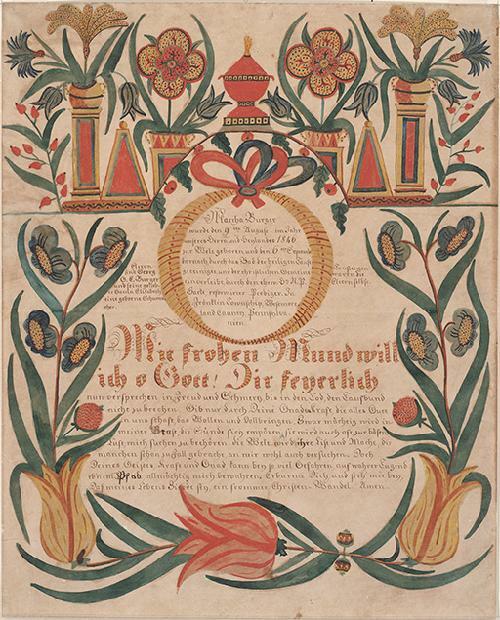 To explore our Fraktur Digital Collection and search for your family records, click on “Collections” from the About the Library page. Good luck with your search!